There are several accesories for the TK-481 that Kenwood manufactures. The KSC-19 is a Trickle Charger (slow charger) for the TK-481. This charger was intended for use with the KNB-16 and KNB-17 Battery Packs. The KSC-24 is a Quick Charger for the TK-481. This charger was intended to charge either NiMH or NiCd Battery Packs. Top picture is the new version of this charger- comes with a switching power supply, the bottom picture is the older version of the KSC-24 charger and comes with the normal (heavy) transformer. The KLH-6SW is a detachable swivel belt loop that allows the KLH-75B/76B/92 heavy duty leather carrying case to clip on to the users belt. The KLH-6SW has a D-ring back and allows the radio to be removed from the users belt by swiveling the KLH-75B/76B/92 to remove the radio. This accessory is made in the USA! The KCT-30 is a 2.5mm receive adapter for use with all 80-series (TK-481) radios. This attachment connects to the side programming port of the radio and allows receive only functionality the radio- to be used with the KEP-3K and KEP-4K Kenwood Earphone Kits. The KBP-4 is an AA refillable battery case/pack that holds 12 (yes, twelve!) AA alkaline batteries. This pack is larger in size then the original NiCd and NiMH batteries. It is not for use with NiCd AA batteries and is to be loaded with alkaline batteries only. The KBH-8DS is a detachable leather swivel belt loop that attaches directly to the radio and allows the radio to be mounted on the users belt. The KBH-8DS has a D-ring back and allows the radio to be removed from the users belt by swiveling. The belt loop of the KBH-8DS stays attached to the users belt, allowing the radio to be removed. This accessory is made in the USA! The KLH-58BC is a Bungi-Cord loop for use with the KLH-75B and KLH-76B heavy duty leather carrying cases. This Bungi-Cord loop goes over the top of the radio to keep the radio secure in the KLH-75B/76B leather cases. The KLH-75B is a heavy duty leather carrying case for the 4-button (non-DTMF) TK-481 and protects the radio from damage. The KLH-75B is to be used with the KLH-6SW which is the detachable swivel belt loop. This accessory is made in the USA! The KLH-76B is a heavy duty leather carrying case for the 16-button (DTMF) TK-481 and protects the radio from damage. 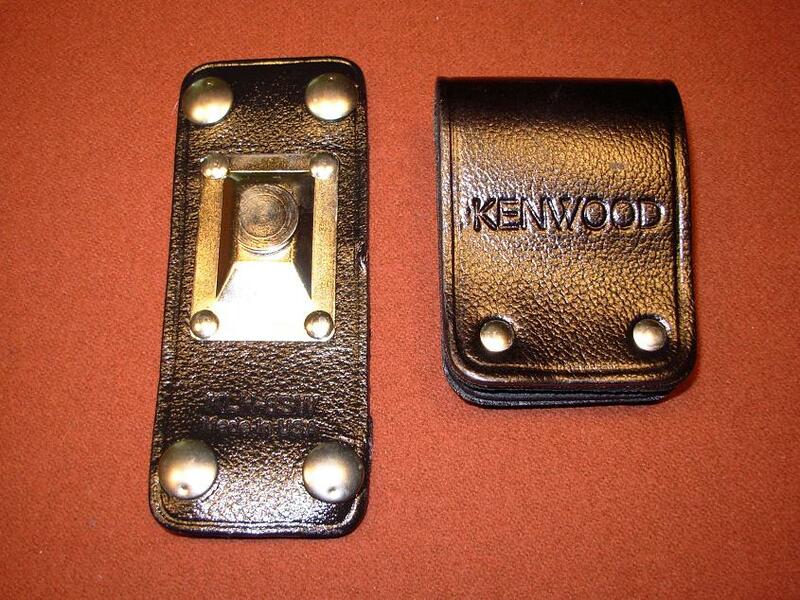 The KLH-76B is to be used with the KLH-6SW which is the detachable swivel belt loop. This accessory is made in the USA! The KLH-85 is a Cordura Nylon Carrying Case for the 16-button (DTMF) TK-481 and protects the radio from damage. The KLH-86 is a Cordura Nylon Carrying Case for the 4-button (non-DTMF) TK-481 and protects the radio from damage. The KLH-92 is a heavy duty leather carrying case for the 16-button (DTMF) TK-481 that uses the KPB-4 AA refillable battery case/pack and protects the radio from damage. The KLH-92 is to be used with the KLH-6SW which is the detachable swivel belt loop. This accessory is made in the USA! The KSC-20 is a simple quick charger for use with any TK-481 NiCd Battery, not to be used with NiMH Batteries. The KVC-3 is a mobile use slow (trickle) charger adapter for the KSC-19 charger used on the TK-481. This charger was intended for use with the KNB-16 and KNB-17 Battery Packs. The KVC-4 is a mobile use quick charger adapter for the KSC-24 charger used on the TK-481. The KVC-5A is a complete heavy duty mobile drop in charger for the TK-481.